Photo of Cecil Correll Griffin and wife Mary Missouri Plyler.click on photo for larger view. . Shown above, LEFT: Cecil Correll Griffin and wife Mary Missouri Plyler. They are buried at Altan. 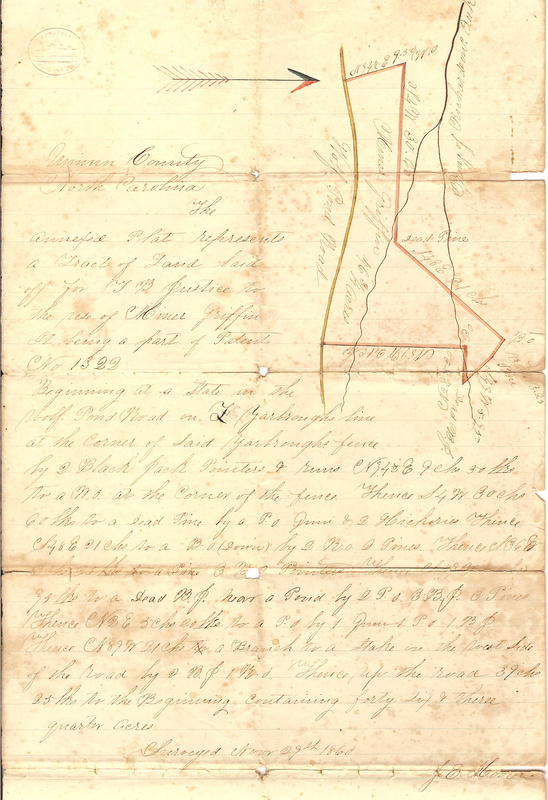 RIGHT: Original 1860 land deed. Per Billie Ranson: I am corresponding with Tommy Cooper, a descendant of Minor Griffin (son of Lee Griffin and Holly Broom). Minor Griffin died in Goldsboro in 1862 . He married Elizabeth C Yarborough. Tommy sent me the 1860 deed for land Minor purchased and it borders Wolf Pond Rd. Minor had only 2 children and one was born after he left for the Civil War. The land stayed in the Griffin family. Tommy says that Elizabeth C Yarborough and Ezekiel, her father, were buried in the woods behind Altan Methodist Church. He said the depressions are still there but no markers although his grandmother remembers sweeping and cleaning the graves when she was a child. 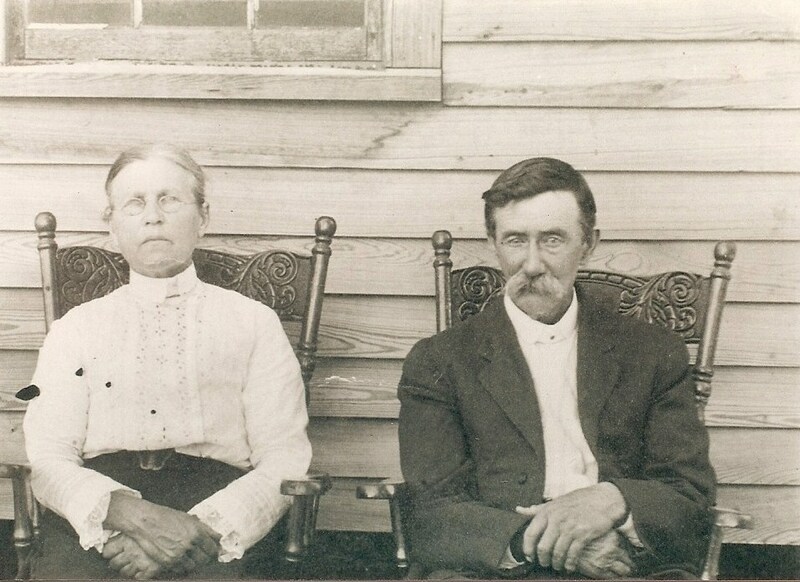 The first son, Cecil Correll Griffin and wife Mary Missouri Plyler lived on the land and the 2nd son Joseph M Griffin, no children, wound up in Arkansas and died in TX. Per Billie: DNA tests show that Lee Griffin, father of Minor Griffin, grandfather of Cecil Correll Griffin, is related to Uriah Griffin (married Dovie Broome) and Jackson A Griffin (of the Sandy Ridge Baptist Church community) and very likely to Richard Griffin, born about 1752 in Chatham Co NC, who signed and paid for Lee Griffin's marriage bond for his marriage to Holly Broome. Richard Griffin is the same man as named on the Revolutionary War marker at the old courthouse in Monroe. He lived until 1851, had a Revolutionary War pension, and was on the 1850 census living with Martha and James Doster in Union Co. Richard was discharged after the Revolutionary War at Cane Creek which was part of Mecklenburg Co until 1842. This establishes a definite Griffin line which may or may not be related to Thomas Griffin who came to Anson right after the Revolutionary War.